Mush was started in January 2013 - just a few months after Founders Yvonne and Julian's relationship started. It is a rather personal project triggered by their affections for each other, and is a reflection of their ever-changing interests and everyday experiences. Their current series is heavily inspired by their childhood obsession - Harry Potter, as well as astronomical instruments and various laboratory apparatus. Though they have different lines of designs, their works all have a rustic twist in common. Join us today as we talk with Julian, 1/2 of the dynamic female duo known as MUSH. 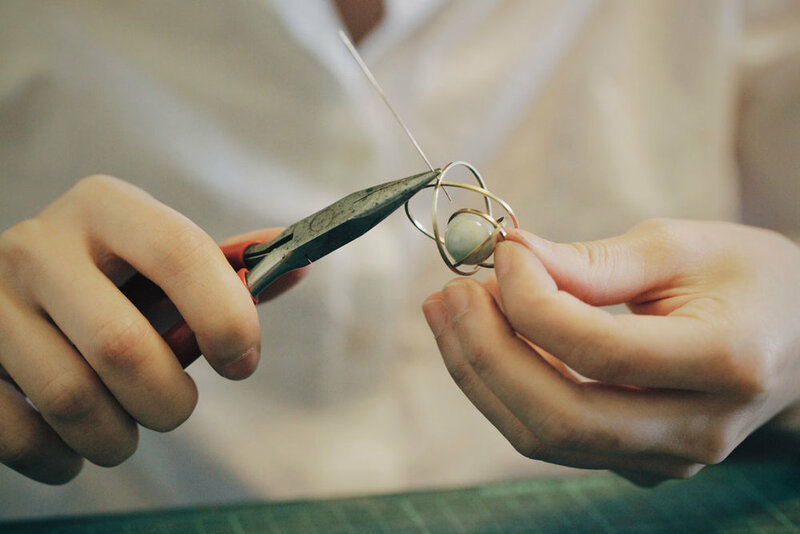 We chat Harry Potter’s influence on design, how people help us through, and Kinetic Jewelry. Julian! Thanks for joining us! Let’s talk a little bit about the overarching idea of MUSH. A thread that seems to be a mark of your work is how orbital and planet like much of your work tends towards. From the spherical stones in natural colors, to gyroscope geometry there’s a tonality and classicism of movement inspire that I can sense. Can you tell us where that comes from? My initial inspirations come from my morbid obsession with Harry Potter – Hermione’s Time Turner, The Astronomy Tower and Dumbledore’s office which is packed with astronomical models as shown in the movies. The vague ideas and images of my first designs were then strengthened and refined by gaining a closer look at the many elements from our everyday life, such as the physics apparatuses and planet models used in Physics and the atomic model in Chemical while in high school; the massive gyroscopes in the opening credit scene and inside the Citadel in Game of thrones…Yes, I am a massive geek! Geekery for the win! Now I understand that HP is something that you’ve cited in other place as a childhood obsession and something that MUSH is heavily inspired by. I’d love to hear more about how Harry Potter inspires MUSH and your design sense. Harry Potter managed to stay an obsession even to this day! Not only did it act as a motivation and catalyst of our design path, it also became the turning point of MUSH. I have always been a DIY-person since little and Mush was actually a small Harry Potter fanpage previously, which sold Harry Potter themed fanfictions, handmade totebags and bookmarks by me. Then I met Yvonne, my partner, who also happened to love DIY. I began crafting her gifts and posting photos of them onto social media. Slowly the page was packed with photos of handmade presents we made for each other. To my surprise it kept receiving positive response, so we took the chance to develop our passion for handcrafting and turned it into Mush. We have had many turning points that sparked the births of different series of work, and Harry Potter is the most significant one of all. The combination of brass and natural gemstones only came into light as I was searching for something of Yvonne’s favourite colour – turquoise, for making a bracelet for her. With the remaining material that was left, I started playing around and realised that maybe I could try making the Time Turner and recreating objects in Dumbledore’s room which have always had me fascinated. Has it helped with the momentum of MUSH? Mush has been ongoing since our university years and now with one of us juggling work and creative project, things can get difficult and unbalanced. Thankfully besides each other, we have supporting families and friends, some of which I have made through geeky conventions, school, and all different kinds of means. It is what I think I can relate to one of the universal themes of Harry Potter the most – the value of friendship. Cheezy as it may sound, friends have helped us through the toughest times, whether be it difficulties at work, in relationship or Mush-related. Occasionally weird conversations with certain friends can even spark great ideas that elevate our designs. Mush sounds like a very personal project, thank you so much for sharing. If you’re comfortable with it do you mind sharing a story of one difficult time where you both really had to depend on each other and your closeness in order to keep going? We often argue over various things like the designs, the packaging, the direction we are going etc as we have different aesthetics, things sometimes get so heated that we start to attack each other personally. There has been a period where we just did not care about each other’s designs anymore and only focused on our own designs and feelings, which in turn had a huge impact in the dynamic between us because Mush is not just something we do together, it is a big part of our relationship. Eventually we made up as we remembered the main reason we started Mush - to heighten our closeness. I think that creative fusion shows in the care of each of your pieces. Now onto a little bit of your craft. Now, I’ve heard of Kinetic furniture - furniture that is designed to encourage movement or utilizes moving pieces to help aide design - but I’m very unfamiliar with Kinetic Handicraft, and MUSH is described as this. Can you explain your ideas on Kinetic Handicraft and how that translates in to the Jewelry that MUSH creates? While our designs and the use of gemstones may remind one of Earth or other existing planets, we in fact never name our designs after any real celestial bodies nor do we try to imitate them while crafting. We are more focused on the materials and the interactions between the metal and the gemstones themselves; also it is because that we want to our customers to look at our designs as if they have made their own discovery of a celestial body, which they can name by themselves! Kinetic energy is the energy an object possesses through its motion. We would like to think that by moving and spinning our jewelries, the kinetic energy created would dissipate into imagination…all available at the tip of one’s finger. I see! Your jewelry not only moves, but it also creates a relationship between the physical world and the user. I like where this is going! As I understand it, creating these pieces requires “basic metal work techniques like metal cutting, drilling, heat treatment, molding, soldering and polishing etc.” Instead of going through the process in steps as in a textbook, can you give us an idea of what you’re thinking about when you create these pieces? From the very start, our vision is that our accessories would be able to spin, after that we want to see them spinning in different directions and dimensions, which they eventually achieved. The kinetic element and complexity of the structure are what we are always working towards, as we ultimately want to make our work closer to the astronomical models that have us intrigued. It depends. For the current series with brass rings and gemstones, it started by trial and error. The images were vague at first and only became less foggy as we brushed up our skills and studied the structures of some actual astronomical and physical instruments, yet there is still so much to explore and learn so our picture is not final yet. On the other side, there has always been a very specific vision for our concurrent series, which is a mix of the current style and the steampunk element. By adding parts of clockwork and metallic spheres, it is our hope that it can bring out the futuristic alien city atmosphere, which is also a theme that we would love to explore more. MUSH is primarily based in Hong Kong and with design influences from Western Literature like HP, I’m wondering if there are aspects of Chinese culture that shape your design and craft vision also? Gemstones are associated with Feng Shui, the change of Chi and improvements in many aspects of one’s life amongst the older and sometimes our generations in Hong Kong. It is often hard to break this stereotype of gemstones being superstitious and old-fashioned. So, funnily, this certain aspect of Chinese culture is what we hope to overthrow with our designs. MUSH began in 2013. It’s now 2017, which means you’ve been going on 4 years strong. Do you have any practical insight for our readers on things that you’ve learned in running your own craft business for 4 years? What are some large challenges you’ve faced or currently face, and what kept you going? Neither of us is from art or design background and we started from knowing nothing to knowing a little. I think it shows that starting your own craft business is more achievable than it may seem if one really has the heart for it. The most important thing we have learned over these years is to never do something that we dislike, we are only still passionate about the works we do because we base our work entirely on our wills and interests, rather than following the trend. We enjoy the creation process more than being able to sell the items. Only in this way Mush can last for so long and hopefully many more years. Mush is a very personal project. You may have seen the changes in our products over the years: the remnants of Harry Potter themed stuff in the very first photos of our pages, followed by vintage-styled accessories, leather goods, steampunk themed jewelries, brass and gemstone designs increasing in complexity and completeness. It all started because of our affections for each other, slowly progresses and evolves at different points in our lives, sometimes because of our new interests, other times because of the events that we have been through. Therefore we think of Mush as a reflection of our past, present and future experience. Sometimes we face creative blocks but we believe that we will be able to keep going because Mush itself is an unknown and is spontaneous as life is, who knows what may become our new inspiration tomorrow! Julian, thank you so much for sharing your story with us, and also for your highly imaginative jewelry. Also thank you for sharing how much not only technical skill, but your relationship is integral to what you do. There’s a youthful inspiration that I got from talking with you. That inspiration is a gift you’ve given me in this short talk together. I hope many others can see what I see in MUSH. Lastly, thank you so much for taking the time to work with us in English. It's evident that the language of passion and creativity is something that surpasses barriers. I do certainly hope that the language barriers are surpassed. Thank you so much.